Types of Truck Cabs Guide: Which is the Perfect Choice for you? Pickup trucks are versatile vehicles. One of the many features you need to choose as an owner is the cabin – the passenger area of the truck. Regular cab with a single row of seats – also known as a single cab or short cab. Double cab with a an additional row of seats that has less legroom – also known as a Supercab, quad cab or king. Crew cab with two full rows of comfortable and spacious of seats – also known as Supercrew or CrewMax. Let’s take a look into the various features of each type, what it’s called in each brand and what the pros and cons for choosing either type of truck cabin are. And because different brands use different terms, I made a table that depicts term changes across brands. So we can all finally know who means what when. That’s further down the post and it’s a crucial tool if you’re shopping for a truck. Oh, and in case you don’t know why I’m researching this, here’s a quick recap of what this blog is all about. We’re a couple in our late 40’s, considering taking the RV route in a few years. 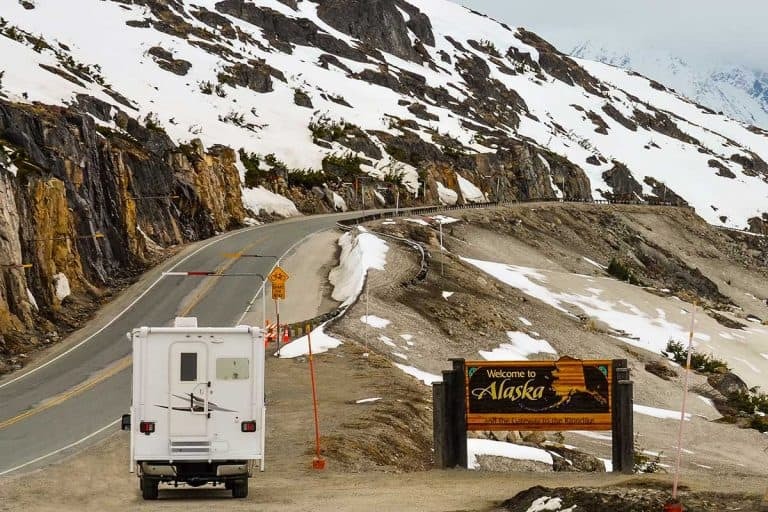 We have a lot of experience with road tripping in the US and Canada but no experience with driving a supersized vehicle, towing or living in an RV. This blog is where I document my research as I’m trying to gain some knowledge on these topics. What’s a truck cab anyway? Cab is short for “cabin” and refers to the part of the pickup where passengers are. This is the sheltered part with seats, as opposed to the open bed of the truck. Commercial large trucks also have cabins, or cabs. The idea is that the passengers’ area is separate from the truck’s bed – the part where you can haul your stuff. In a truck – pickup or otherwise – there is no direct contact between the cab and the back of the truck. In essence, when discussing types of truck cabs, we’re talking about what’s the passengers’ area is like. Is there one row of seats or two. Are there two doors or four. Does the second row door a full door that you can open independently from the second. How much room do your backseat passengers have. Some truck cabs are “strictly business”. These trucks are meant to haul or tow loads – not humans. They have room for a driver and one or maybe two passengers. Other pickup trucks have luxurious cabs that put the number – and comfort – of human passengers first. These trucks can easily take five and even six passengers and offer them a lot of space in each row. Let’s look at the different terms used for truck cabs and see what they mean. The terms sometimes change between manufacturers, but you have three basic configurations mentioned at the top of this post – regular/short, extended/quad/king, crew/supercrew. A regular cab pickup aka “short cab” or “single cab” has no rear seats or rear doors. Although these somewhat old-fashioned types of truck cabs generally have high towing capacities, they are no longer as popular as other pick-up trucks with extended or crew cabs. Regular cab trucks offer the least amount of people or storage space compared to other cab styles. People who usually drive with one or no passengers are best suited to find short cabs preferable over larger trucks. A double cab – also known as a quad or Supercab – has a second row of seats but that row has less space (compared to a full crew cab). These cabs sometimes have only two doors instead of four. When they have four doors, those of the second row are smaller and often rear-hinged, which means they open in opposite directions as front doors. They don’t always have handles on them. You may need to open the first row door first, in order to reach the handle for the second row door. When you look at a truck and see two rows of seats but what looks like no doors – or doors that are smaller than the main pair of doors – you’re probably looking at a double cab. Nissan uses the marketing term “king cab” to designate double cabs. Don’t be fooled by the royal title though. It may be fit for a king, if that king isn’t driving passengers around. The seats in the second row are folding seats. Basically, it’s a space where you can place your groceries and stuff. If you have to, you can fold out those seats and have kids – or very small adults – use them. This is the largest of all pickup truck cab configurations. The idea here is that if you’re a contractor, you can take your work crew along with you. And if you’re a traveler on a road trip, you can take your friends or family along. Most companies use the term “crew cab” to signify two full rows of seats that can comfortably seat 5-6 adults. A crew cab usually means a larger and more spacious type of cab, with four full doors. If you’re looking to take five or six adults on the road, you should probably be looking for a crew cab. All that said, in most cases rear rows of crew cabs are still smaller than front rows. Not all crew cabs offer enough legroom for second row passengers to be comfortable enough during long trips. You may have noticed I mentioned some brand names already. There’s a good reason for that. All of these terms: crew, extended, short, quad, king? They do not reflect any “official” industry standard. Truck makers choose whatever they want to signify whatever they want to sell. As if that’s not enough, the standards within the same company sometimes change over the years. If you’re looking to buy a truck, make sure to investigate the exact specs of the model you’re looking into. Don’t rely on what they call their cab – check out the cab on their website. I checked the types of cabs available from leading truck brands for 2018. Hopefully this will help you figure out what to start looking for. Here it is in detail for the three leading brands of truck on the market with data about legroom that clearly shows the difference between the full two rows of seats configuration and the limited two rows one. Regular – One row of seats. Double cab – Two rows of seats and four doors but only 34.6″ in legroom for the second row. Crew cab – Two rows of seats with 40.9″ in legroom for the second row. Supercab – two row of seats and four doors (opposite hinges). Second row has 33.5″ in legroom. This is essentially Ford’s extended or quad cab. SuperCrew – Two rows of seats with 43.6″ in second seat legroom. Quad – two row of seats and four doors. 34.7″ of legroom for second row. Crew – Two rows of seats with 40.3″ in second seat legroom. There are many considerations when choosing a pickup truck. 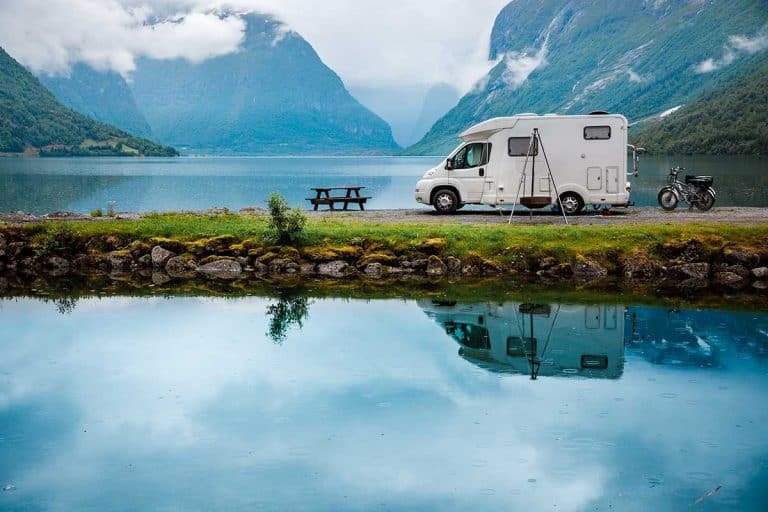 For example, if you plan on towing an RV, you’ll have to pay attention to choosing a truck that’s strong enough and has good towing abilities. Whatever the engine type or towing capacity, you can choose a passenger cab that suits your needs. The type of cab is a separate issue as most pickups come in various cab configurations. You can have a short cab with a mighty F-350 or a crew cab on a light-duty truck like a Ford F-150. So, for now, let’s focus on choosing the right tuck cab. Cab size directly affects the length of the entire vehicle. Selecting a larger cab along with a longer bed means you will end up with a longer pickup truck. That’s a pickup that’s more difficult to maneuver and park. 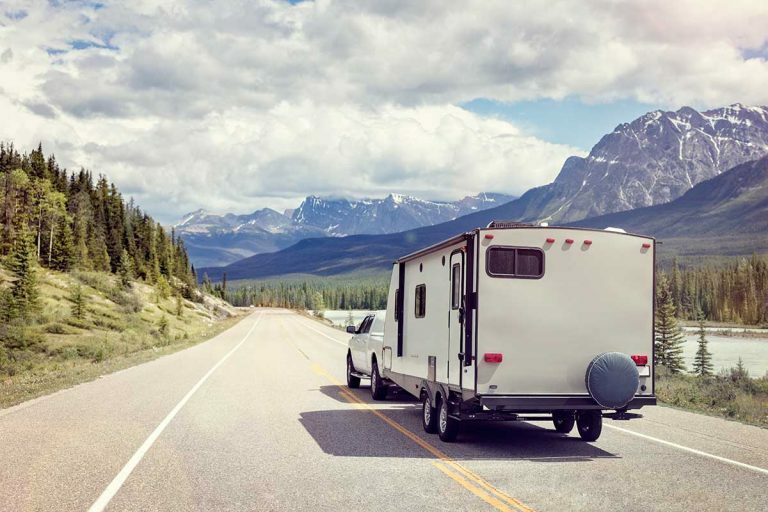 If you plan on towing a trailer, you can choose a truck model with a shorter bed to balance out your choice of a long crew cab. 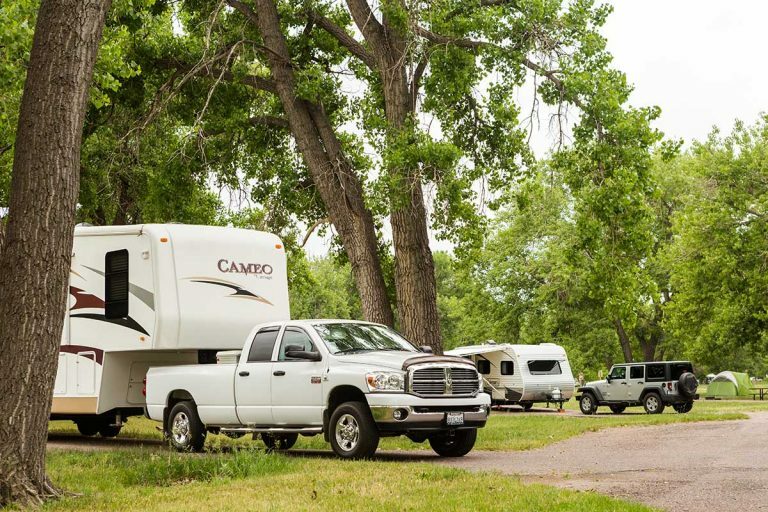 However, if you plan on towing a huge 5th wheel, you may need a longer bed to accommodate your rig comfortably. Not sure what I’m talking about? 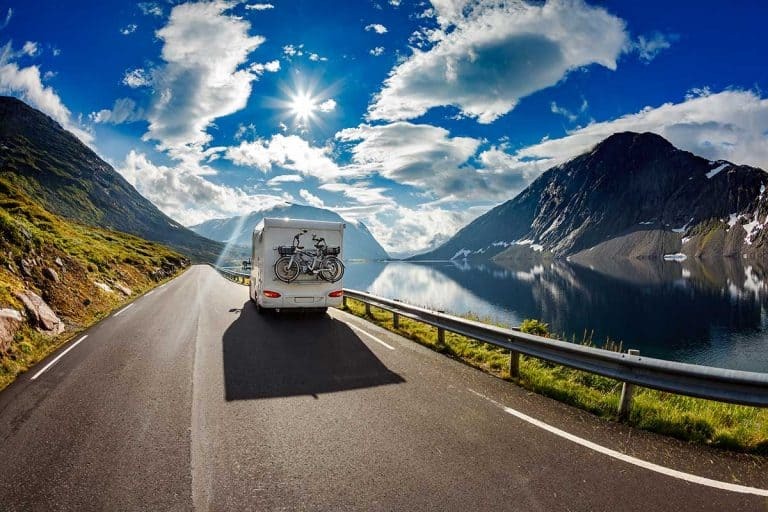 Read my post about types of RV’s to see what’s the difference between a trailer and a 5th wheel. While you do have a choice between various cab sizes, they are limited by what manufacturer’s offer for specific bed lengths. For example, if you want a Ford F-150 with an 8 foot long bed, you won’t be able to get a crew cab. Such long beds are meant for work and not play, plus Ford puts a limit to the overall truck length. If you need such a long truck bed as well as transport people around, you’ll be limited to three F-150 models – the XL, XLT and Lariat – and will have to choose a SuperCab (Ford’s term for a double cab). 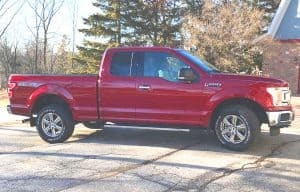 By the same token, if you want a super short bed, Ford assumes you’re buying a truck for family use, so these trucks are mostly available with long supercrew cabs. You can’t mix a short 51/2 foot long bed with a short cab. The most you can do is get a Ford F-150 Raptor with a super cab. Any other models with this length of beds are available only with a supercrew cab. If you’re sure that you’ll never need to drive more than two people around, then a regular short cab is probably what you need. You may be able to get away with a regular cab for 2-3 people if you get a model that doesn’t have a center console. These models have a bench configuration which let’s three people share the seats. However, three is your upper limit with a regular cab. If you need to drive more people around, you definitely need a larger cab, which means either a crew cab or a double cab, so let’s compare these two options. It’s worth comparing the two at this point. Both crew cabs and double cabs support the same number of passengers. With two rows of seats they can take 5-6 passengers so may appeal to families and people who need to drive passengers around. They’re shorter, making the entire vehicle shorter. And a shorter truck is easier to drive around. However, you’re giving up on passenger comfort to get that. A double cab means the second row of seats is less spacious. In some models, it means no second set of doors, so your passengers rely on front-row passengers getting out before they can enter or exit the truck. In other models, the doors are there but they’re smaller and may also require the first row doors to be opened before they can be used. What’s more important, trucks with crew cabs have increased legroom and an overall more comfortable ride. Which brings me to the next point. Clearly, a crew cab is more comfortable for adults traveling in the second row. If you have adult passengers who will be using the second row often, a crew cab is the way to go. A double cab is really for people who only take passengers for shorter rides and don’t do that often, or if those backseat passengers are exceptionally small. As a rule of thumb, the older (larger) your passengers and the longer they’ll have to spend in the second row of your truck, the more likely it is you’ll need to opt for a crew cab. 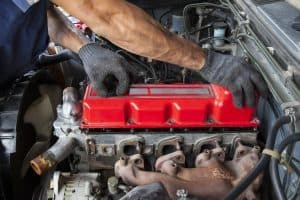 Your truck’s final price will be affected by many variables. 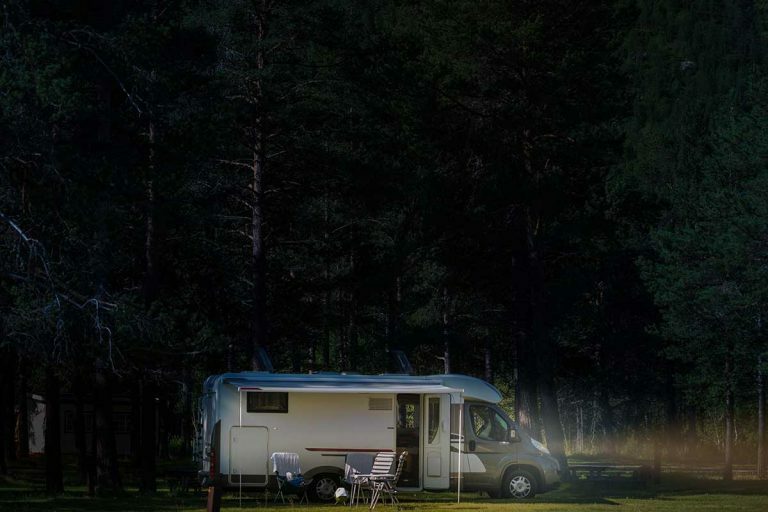 When you buy new, you can pick and choose most of the elements of your vehicles and construct the truck of your dreams, or at least the one that fits your needs and budget. Note that brands have specific “mixes” on offer. For example, you can’t have a Silverado crew cab with a long box and the double cab is only available with a standard-length box. After all, Chevy doesn’t really build the models per your specifications, it just allows you to choose from several combinations that are available. When buying used, you’re basically limited to whatever configurations of trucks happen to be sold around you at the time. If you want a crew cab with a short bed GMC Sierra 1500, you may or may not find one around you. You may need to travel to a different county or even state to find one that suits your needs. And when availability is limited, you have less room to negotiate the price. With that in mind, I tried to get an estimate of the difference in cost of the cab itself. I checked the two most popular truck models in the US right now, the Ford F-150 and the Chevy Silverado 1500. 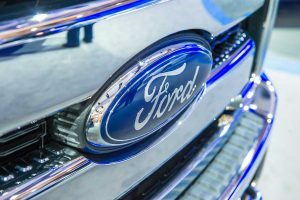 Ford offers several models of the F-150, starting with the cheaper XL and XLT and going up to the high-end F-150 Platinum and Limited. As mentioned before, there are limitations to what kind of cabs you can mix with what kind of bed lengths, so let’s use the F-150 XL with a standard 6.5 foot long bed as our point of reference. In other words, upgrading from a regular cab to a double (super) cab will cost $4085. Choosing an even larger cab – the Super Crew – will cost you an additional $3760. These are the five configurations of cab and bed that Chevy offers. 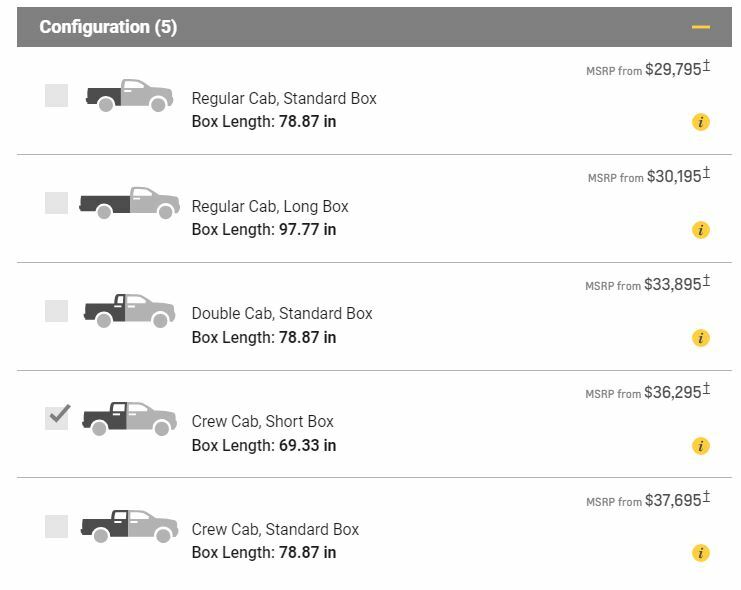 As you can see, the easiest and most sensible way to figure out the actual cost of your choice of cab is to compare trucks with a standard box. In other words, upgrading from a regular cab to a double cab will cost you $4100 on a new Chevy Silverado 1500. Upgrading even further to a crew cab is going to add another $3800 to your tab. Are there truck cabs for more than six passengers? If there are, I couldn’t find them. Leave me a comment if you can think of one. Pickup trucks have at most two rows of seats. The first row usually has room for two passengers with the a center console in the middle – or possibly three passengers with a bench-type seat and no center console. The second row usually has three seats. So, we have a total of five – and possibly six – seats altogether. Need to carry more than six passengers? Then you’re looking for a large SUV like a Chevy Suburban/Tahoe or a Ford Expedition. A midsize SUV like the Nissan Pathfinder can technically carry seven people but it can get crowded in the third row. A full-size SUV can carry seven adults in comfort – and sometimes even eight, depending on seat configuration. More than 8 people to drive around? You’d have to be looking into a full size van or two vehicles. Vehicle #1 was a heavy duty pickup that towed their massive 5th wheel and vehicle #2 was a small van. Between the two vehicles, they had no issue taking all dozen passengers or so. Whew, this ended up being quite a long post. I’d love to hear other people’s opinions on this topic. Do you own a truck or have you owned one in the past? What is/was your choice of cab? Can you share your experience in a comment? Previous PostIs Driving a Pickup Truck Hard? Next PostDiesel Vs. Gas Pickup Trucks – Which Is Best? Can You Plow with a Ford F150? How Big a Travel Trailer Can an F-150 Pull? Diesel Vs. Gas Pickup Trucks – Which Is Best?